The bedroom is a place for rest and relaxation, a room that should be peaceful and tranquil. If you’re planning a complete room overhaul or you’re just looking for a few quick and easy updates, these creative bedrooms are sure to inspire you! 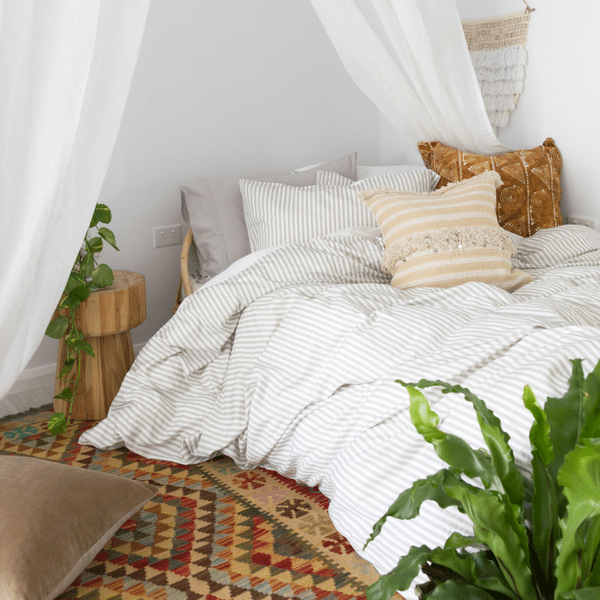 Bring the outside in & create your very own jungle oasis in your bedroom! Not just aesthetically pleasing but your green buddies will also clean the air for you – win win! Click Here to check out how well our white bedding pairs with a green leafy room! Re-purpose some old pallets & create your own Pallet bed – keep it natural or apply a coat of your favourite coloured paint for your own personal touch! A bedroom rug can add much-needed colour and texture to your space, whether you prefer soothing neutrals or something a little bolder. Regardless of what you choose you are bound to find a companion for our warm Latte Bedding – Click Here to see our fave Latte styling! However it is you decide to style your bedroom be sure to add some eco-friendly YoHome touches like our 100% Bamboo Bedding – the perfect non-toxic bedding option! P.S Our super popular Bamboo Quilts are now officially now back in stock! Choose between teal, silver, pewter & bamboo charcoal & introduce the perfect light-weight quilt into your home! Regardless of what colour you choose, you’ll enjoy a carefully constructed quilt that will look and feel amazing for years to come! Be quick, GRAB YOUR OWN HERE, stock won’t last long!